Like many of you reading this, I'm a fan of pop culture, and of movies in particular...but I'm not a "film historian." I like movies from various eras and genres, but when it comes down to it, I'm probably more popcorn than avant garde. Too often card-carrying film historians treat the rest of us like so much rabble, that we don't have anything to offer beyond lining up like sheep for the newest superhero movie. They don't bother to interact with the masses, because we don't deserve their splendor. So when I find someone who's able to introduce some of the big ideas of film history in an easy to digest, even pleasant format, I take it. Cartoonist Edward Ross achieves that with his 2015 graphic novel-format collection of essays, Filmish: A Graphic Journey Through Film. Using more than three hundred films ranging from the artsiest to the popcorniest, Ross presents the history of cinema in a way that doesn't talk down to readers, but packs each page with information ranging from the tenchical to the philosophical. The seven chapters present the range of ideas you'll encounter: The Eye, The Body, Sets and Architecture, Time, Voice and Language, Power and Ideology, Technology and Technophobia. Using the chapter Sets and Architecture as an example, Ross uses the urban settings of Taxi Driver, Breathless, and City of God to introduce the idea that a setting is loaded with meaning, before moving on to the worlds of the Star Wars movies, and the over-the-top sets of 1916's Intolerance and 1997's Titanic, with 1914's Cabiria as a note. In two pages, he uses examples from seven different movies (twice that, if you split Star Wars into multiple films). I'm embarrassed to say that even though I know the cinematic significance of Taxi Driver, I've never actually seen it. So of the movies used in those pages, I'd only seen Star Wars and Titanic. I looked up the Babylonian scenes of "Intolerance" on YouTube (and you should, right now) and they're staggering. Following pages develop the idea of sets and settings further, departing from the realistic to the symbolic, with The Cabinet of Dr. Caligari and Black Narcissus. He takes us to haunted houses, to science fiction settings, to "real world" locales even more real than the real world. In this single chapter he either specifically cites or takes inspiration from more than thirty movies. Some of these are direct quotes, others are visual cues that he includes in his drawn artwork. For those of us (me) who miss those cues, he includes endnotes for almost every panel at the end of the book. His artwork is clean and cartoony, with the black and white line drawings a good fit for the many different cinematic styles he's going to be visiting throughout the book. One of the things I liked best was how Ross inserts himself (bespectacled film nerd) into many iconic movie scenes. He's the "chestburster" exploding onto the table in Alien. He's piloting H.G. Wells' Time Machine. He's Danny, riding up and down the hallways of the Overlook Hotel. Ross addresses the reader directly, with an omniscience that never comes across as a lecture, and a wit that makes you feel like it's your friend telling you the story of cinema. The biggest problem with "Filmish" is simply that it's good enough that it makes me want to watch (and in many cases rewatch) about three hundred movies. If you're looking to get a broad view of the history of the movies, and get a closer look at some of the themes that are repeated in those movies, you should check this book out. If you already know everything about the movies, you'll still get something out of it. It's a charming read, no matter what your expertise level is, but it doesn't focus on any one film or director long enough to get the depth you may be craving. For me and my nerdy needs, this was pretty much perfect. In the Classroom, if you're teaching a unit on filmmaking or film history, this is a no-brainer. Use this book. 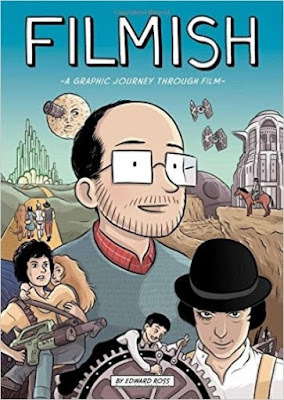 But even if you're not -- if you're teaching a history or ELA class that's about a specific time period (especially twentieth century history), use Filmish to find movies that connect to the time and curriculum you're teaching. And then don't show the whole movie. A five minute video clip of Buster Keaton will do more to engage kids than showing them the entire movie. They'll get it, and get enough of it, to make them want to see more--but it will hook them into your lesson. And that's what you want.